Front Adhesive Window Sticker Deliver targeted marketing and are the perfect solution for retail applications as they are mounted on the inside of the glass thereby removing the potential for vandalism and graffiti. Define the goal of your sticker marketing campaign right away. You might want to increase brand recognition, or you might want a direct response (visiting a website, calling a phone number, etc.). Whatever you goal is, make sure you sticker design, shape, size, placement and message all work to that end. 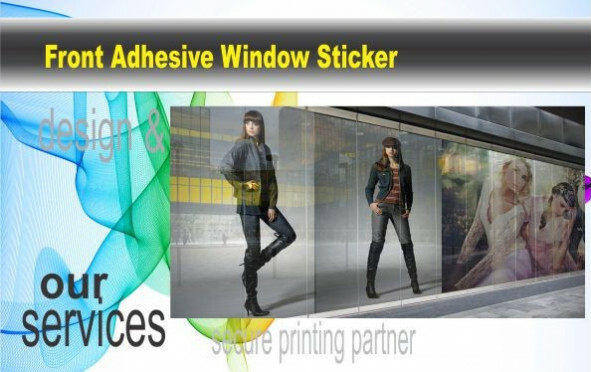 What is a Front Adhesive Window Sticker? The sticker is a reversed image, translucent material with white backing paper. It is applied inside of the window. It will block out the light coming in from the window.